The materials that are used to keep wet concrete in the correct position until it has set. After a period of time it is usually removed. Also known as Shuttering. Usually in 2400 x 1200 (8ft x 4ft) and either 12mm, 16mm or 18mm (1/2", 5/8", or 3/4") thick this plywood is made by various manufacturers with strength, water resistance and finish being the main criteria. Both sides are usually coated with a hard smooth resin finish. A generally low viscosity oil that is easily sprayed onto ply or steel form surfaces to stop the concrete sticking to the forms. Also called release oil or release agent. Traditionally the material used to construct and support the forms or shuttering for concrete has been timber. However new materials and techniques are being used all the time, but it would be fair to say that timber and plywood as seen in the photos on this page is still the main method for general contracting. 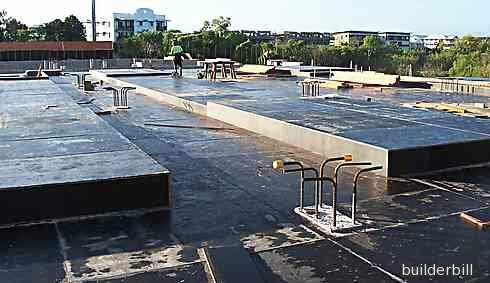 Above, form work being prepared for a suspended slab on a multi-story building. In this case it consists of formply on timber joists and proprietary metal props. 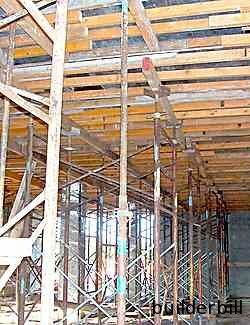 When the carpenters have finished and before the rebar is placed the formply is treated with form oil. Form oil prevents the wet concrete sticking to the ply. It helps to create a good smooth surface to the finished concrete, makes stripping easier and it protects the surface of the forms and so extends their usable life. Release Oil Should not be home made (the author has seen various recipes including the use of waste sump oil) as it can leave unsightly stains. It is often sprayed onto the surface with a backpack spray. In this case care should be taken not to contaminate nearby rebar with over spray. At the right is the underside of the same slab showing the system of supporting the concrete formwork, and more importantly the rebar and wet concrete until the concrete has set or cured.